I just added a neat feature to Flempo: You can save your task filters. If you set up a filter and follow the “Save filter” link next to it, you’ll be prompted to provide its name. Once you do that, the filter will be saved for you under that name. It’ll appear in the menu under the standard filters. 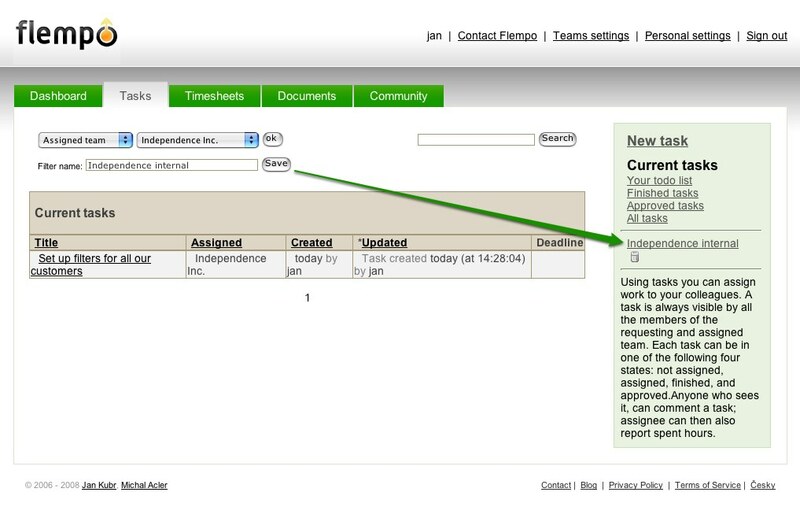 Click here to see the example of saving a task filter in Flempo. Now to the hacking. I thought it would be nice if I could further filter on a custom filter. I’d be in Current Joe’s tasks, but I’d like to see Joe’s current tasks for a customer X. I didn’t really figure out how to keep the UI simple and provide this functionality at the same time. But then I realize the UI is there, but only in your address bar. go to that URL and bookmark it.